Vine and vineyards near Naousa in Central Macedonia, Northern Greece. 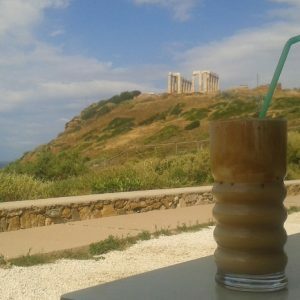 Half a year ago, I first wrote about Greek wines and the wine tasting experiences that complement many of our land tours and cruises. At that time of year, Assyrtiko, the famous white variety from Santorini with its citrus fruit aromas and mineral notes, was a great choice, welcoming spring and a new travel season and introducing the Greek vineyards. Today, a few days before Christmas and New Year’s Eve, is the perfect time to introduce you to another indigenous Greek variety, the traditional Xinomavro, traditionally dominating red wine production in Northern Greece. 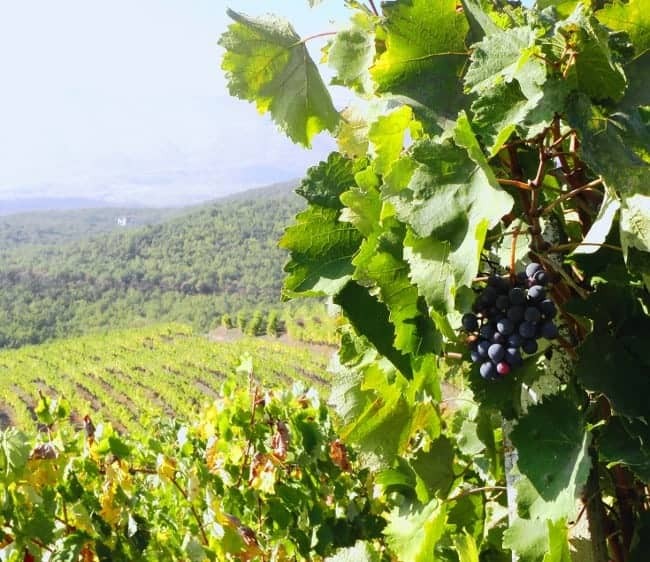 Covering more than 7,000 hectares (18.000 acres) across the country’s Macedonian region, Xinomavro can claim its pride of place not only among the European vineyards, but also in the hearts and on the palates of discerning wine lovers. 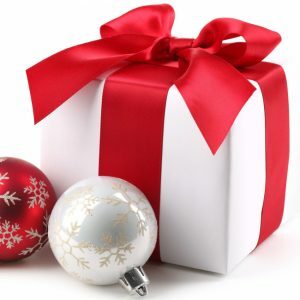 To the anglophone ear, Xinomavro is a very odd-sounding name, due to the starting “x”, a double consonant pronounced as “ks”, like the “x” in “box” or in “Xavier” but not the one in “xylophone” and other rare words of foreign “etymology” starting with that same letter. The name of the Xinomavro grape translates as “acid black”, which is very fitting since it produces wines of good acidity and slightly tannic character. 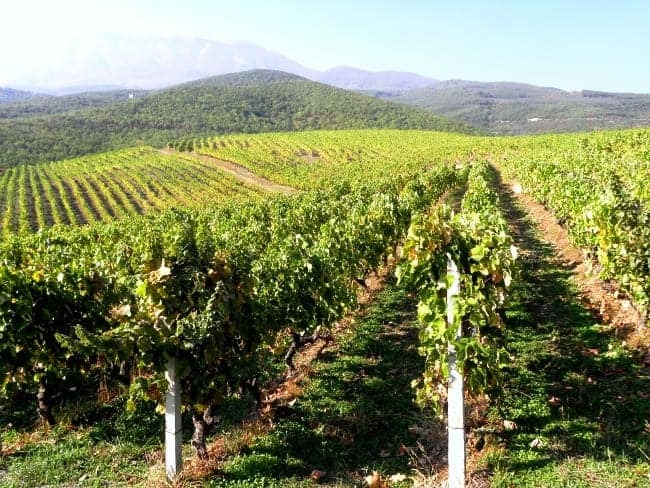 The main cultivation area of Xinomavro is the high ground of Naousa, located on the slopes of Mount Vermion, one of the first AOC (Appellation d’Origine Contrôlée) regions to be registered in Greece, now classified as a PDO (Protected Designation of Origin) in the European labelling scheme. It is also grown elsewhere in the region, e.g. at Goumenissa further north, Rapsani by the foothills of Mount Olympus and in the area of Amyntaion (also Amynteon), a mountainous region west of Naousa, of remarkable beauty and surrounded by several plateaus, lakes and important wetlands with various endemic species of flora and fauna. 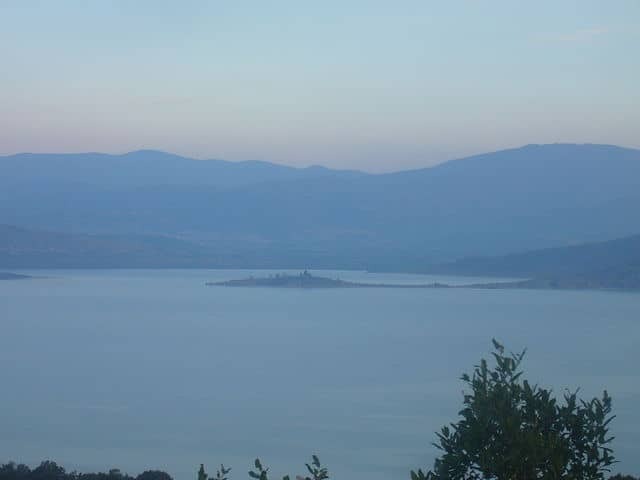 Indeed, the climate and ecosystem of Macedonia in Northern Greece favour the production of red wines, as the region’s vineyards grow in a special set of locations, enjoying privileged conditions. Naousa vineyards on the slopes of Mt. Vermion. At Naousa, the heart of Xinomavro cultivation – and also the place where Aristotle tutored Alexander the Great between 343 and 340 BC BC! – this is very apparent. The vineyards are located at an altitude of 150 to 350 metres (500-1,150ft) above sea level on the southeastern slopes of high mountains. Carefully protected from the cold northern winter winds, they also get the full benefit of the midday sun. 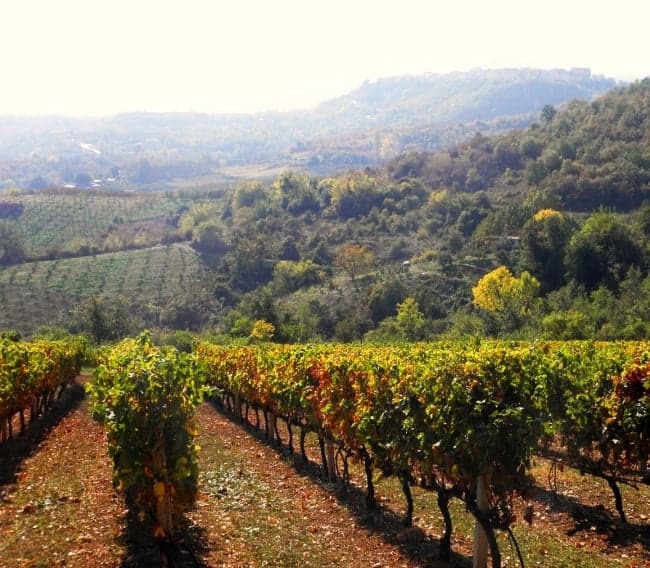 Xinomavro occupies around 500 hectares (1,200 acres) in the designated Naousa region, cultivated by approximately 10 small wineries, while the entire wine zone is divided into terroirs following the standards of the French vineyard system. From the late 1980s and early 1990s onwards, a growing number of small producers have radically changed their methods and standards of wine-making, combining classical tradition with new processes and modern innovations. 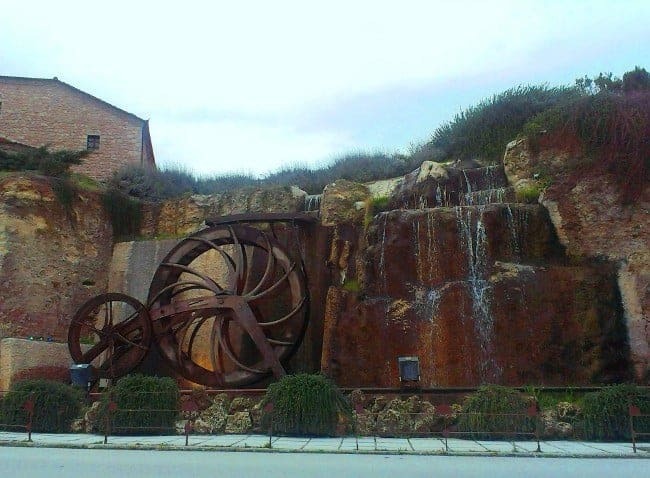 The old water wheel at the entrance to Naoussa. The waters of the river Arapitsa, rushing down from Mt. Vermion, flow across the centre of the town. From ancient times and the Classical period to the modern day, wine has been and continues to be a key feature of the Greek diet and of daily meals, be they casual or formal. 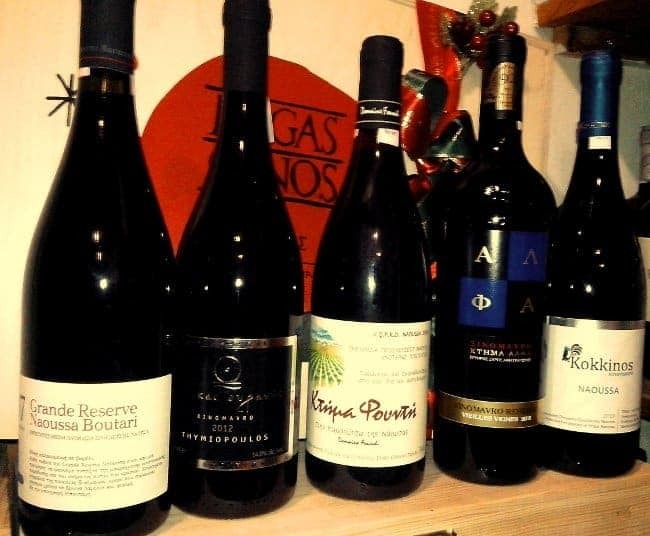 However, if there is a future for Greek wine, it will reside to a substantial extent in the country’s indigenous varieties, which offer unique and original wines, unveiling the various flavours of the Greek soil. A bunch of Xinomavro grapes on a vine outside Naousa. Xinomavro – the Greek Pinot Noir? 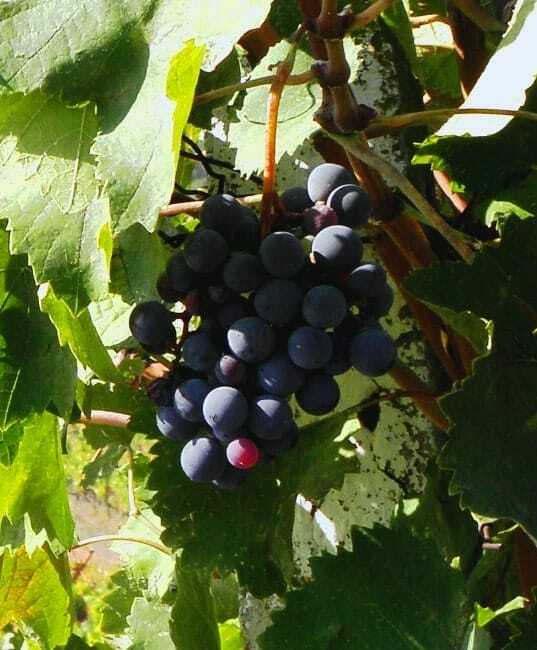 As the image on the left shows, the Xinomavro grape has a dark red, almost black, colour and grows in bunches of high density. It offers red dry wines, dry rosé as well as some whites (blanc de noir) or semi-dry variations. Their main features: medium to full body, clear bright ruby colour, high acidity, long aftertaste, strong tannins and aromas. Red ripe cherry fruits (wild strawberries, gooseberries but also figs), predominate along with tomatoes (fresh, sweet or sun-dried) and a touch of spice on the finish, sometime mixed with ginger, tobacco or even chocolate flavours. Nevertheless, Xinomavro is distinguished for its long ageing potential, which can be exploited to further improve its quality, mitigate the aggressive tannins and develop a great body structure. Vineyards in autumn, overlooked by Naousa Town on the horizon. So, it is not by hazard that Xinomavro is considered the noblest indigenous variety of Northern Greece, described as the Royal Red of the North or even more frequently as the Greek Pinot Noir. Well, Greeks love to exaggerate, but in this case there is a good reason. Xinomavro is a truly unique red wine and experts often say that its depth compares with the wines of Burgundy and Piedmont, with Pinot Noir, which has the most complex aromas in the world, and with Barolo – a surprising combination at first sight, as those two famous wines are very different from one another. As a matter of fact, Xinomavro in its youth has the strong tannic character of Barolo, but in its maturity, when the tannins are reduced, it becomes more like the great red wines, developing a character of earth, forest, deep flavours and a great body. All the above, along with the high acidity, the earthy and spicy aromas and the excellent notes of concentrated tomato sauce make Xinomavro an unusual wine, superbly suited to be paired with food. Xinomavro loves tomatoes, marinades, sweet tastes and recipes using wine. It is thus perfectly suited to traditional Greek cuisine and its various playful variations. Bottled Naousa wines from various winemakers, all of them based on the Xinomavro grape. Simple favourites like lamb or meatballs with a basic tomato sauce can be perfectly combined with the flavours of this red wine from Northern Greece. 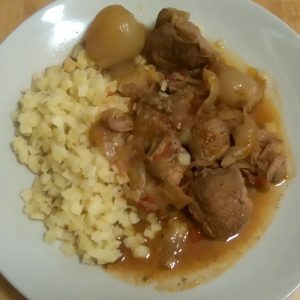 Equally, so can more complex tastes, such as a dish in the syle of coq au vin, wild boar with prunes or a traditional Greek stifado – a casserole of veal, beef or rabbit with baby onions and tomato sauce. What we suggest today is an easy and fast recipe, a simple and savoury finger food or starter of sausage, onions and prunes (or dried figs). The dish is not just appropriate for a festive meal, it is also a great complement to the tannic character of Xinomavro or to a well-structured Cabernet Sauvignon. If you are a wine lover and this post has inspired your interest or your appetite for the originality of Xinomavro, and if you desire to taste its aromas for yourself, you can check online for a wide list of international distributors. Even better, if you are curious to discover all these flavours in their homeland, along with amazing landscapes and first-rate archaeological sites and museums, join us on our From the Slopes of Mt Olympus to the Shores of the Aegean tour. You’ll experience the region’s history, culture and gastronomy, enjoying several wine-tastings at selected wineries, distinguished by their excellent quality and beautiful settings. Heat approximately 2 tablespoons of olive oil in a large non-stick frying pan. Add the onions, the star anise, the dried juniper berries, salt and pepper. Cook gently on a medium heat for about 5-8 minutes until soft. Pour in the balsamic cream, reduce the heat to low and cook for about 10 minutes more, or until golden brown and caramelized on the bottom. Spread out on a plate to cool. If the prunes are too dry and firm, soak them in water for softening, then slice them in small pieces. Slice the pork sausages into small cubes. 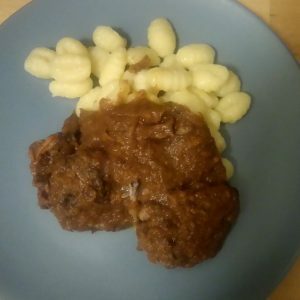 Place the sausages, caramelized onions and prunes in a mixing bowl. Season with salt and freshly ground pepper and then mix all the ingredients together. On a lightly floured surface, roll the puff pastries out into large rectangles roughly as thick as a coin. Cut them first lengthways into long strips, then across into medium-sized rectangles. Combine pairs of rectangles, placing one piece above the other (this makes them turn crispy in the oven), then place 1 tablespoon of the mixture along the centre of each (double) rectangle. 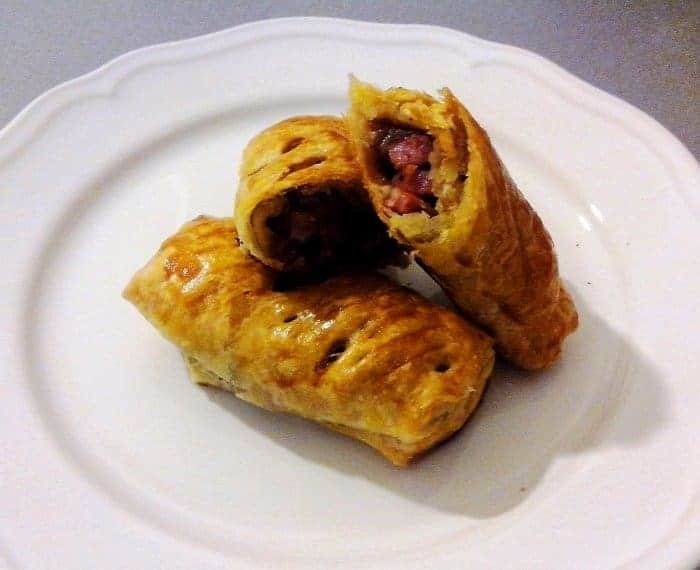 Roll the pastry, with the sausage mixture into sausage shapes, but not too tight since they will puff up while baking. Mix the egg yolk and milk and brush them on the upper part of the rolls. Place the rolls in a baking tray covered with waxed paper and bake them for around 30 minutes until puffed, golden and cooked through. Serve warm, straight out of the oven, and enjoy with the wine of your choice.